Every neighborhood has one, at least as kids we thought so. I didn't vote last session, but I love this photo. What a super technique. I will give it a try and see if I can do that too. Congratulations! Alright! Another winner using a Canon Powershot G series. Loved your submission. Keep up the goor work. As soon as the shutter is opened the flash was executed, (on the G1 if the flash is on it will happen automatically) right after the flash is over have the subject hit the floor and get out of the frame quick. Try it, this technique has been around for a very long time for film users. haunted house? good pic, however. Great! Definitely one of my favourites!!! 10 - KAOS. Wow. Best of all. A 10. Terrific job. I think the exposure on the girl is perfect. I like the ghost effect which acomplishes the challenge 100%. Well executed. wow. that's really neat. I've played around with superimposing too! it's fun and you can get some really neat things! i like it! no blur at all in this shot way to go! Which challenge are you in? This is a good photo...but, I wonder how the effect was done without photo shop or another similiar program. My vote is based on this not being altered...but, I still wonder how it was done. I don't know how you did it but if it's legal, it's amazing! Terrific attention to detail, even the black cats on the night gown and her expression is perfect. The only thing is I think it is "haunted" house. Still a perfect 10! Cool shot. Good effect. I assume a piece of glass for reflection. Makes you think. Verry nice effect. I think you could have made this more errie though with some more thought into the over all compostion. Very cool - neat shot. An exlelent photograph, I think the transposition is exelent. Its a shame the subjects head seems to be slightly imbeded into the top of the alcove but the angle in which she is posed in helps to negate this impession. 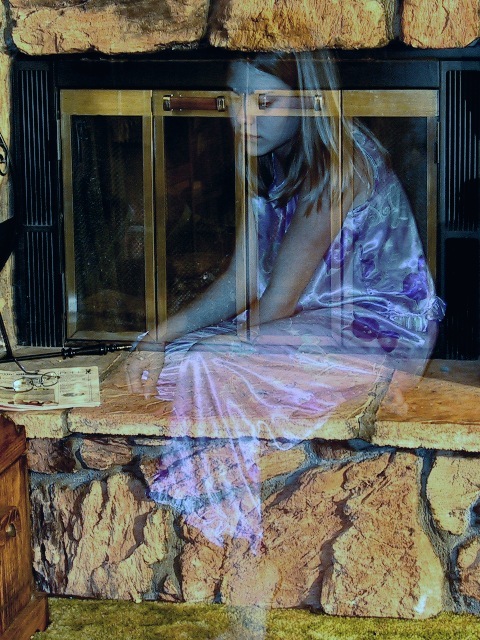 a 9.
this is so cool, love the ghostly cast on the girl. your use of color is excellent. the only thing that bothers me is the top of the fireplace that cuts off her head. Proudly hosted by Sargasso Networks. Current Server Time: 04/22/2019 04:40:46 PM EDT.